Better Homes and Gardens came out with an interactive room arranging application a few years ago. It has been a while since I have been back on the site. Some things have changed for instance they now require all your personal information before being able to arrange a room. After you get through the lengthy login process the Arrange-a-Room application is very easy to use. It lets you select a room shape. If you wanted to design a specific room you can change the dimensions. After you have picked the dimensions you start adding furniture. The application essentially only allows you to design living rooms, bedrooms, offices, or dinning rooms because of the small selection of furniture the application offers. 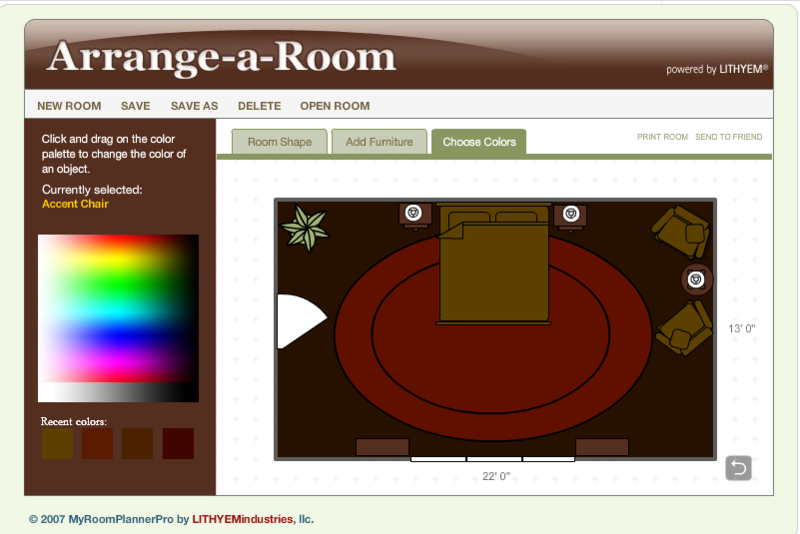 After you have arranged furniture you get to color your room and the furniture in the room. You can see my example below. Pretty cool for being free but not the most sifisticated. This would be a good activity for middle school or for basic furniture arrangement. Another idea might be to use this program for a life skills class that has to furnish an apartment.